Three Grand Rapids-area schools were recognized Wednesday night (May 18) as winners of the 2016 “Be a Basin Buddy” Student Video Contest at the seventh annual Groundswell Student Showcase sponsored by the City of Grand Rapids Environmental Services Department. Groundswell is an environmental education network housed in the College of Education at Grand Valley State University. During the 2015–2016 school year, more than 3,500 local students from 30 local schools participated in Groundswell, 800 more than last year. The initiative is funded through the Great Lakes Fishery Trust, the Michigan Department of Environmental Quality, the Wege Foundation, and The Baldwin Foundation. The City’s Environmental Services Department partnered with Groundswell to promote the inaugural “Be a Basin Buddy” Student Video Contest. Grand Rapids Public Museum School submitted a video highlighting the importance of picking up after pets in order to prevent waste from entering the City’s storm drains. The video, shown above, was only a part of what the class has done this year. It also has participated in the after-school Lyceum Course: Hidden Creatures of the Grand, the state Department of Natural Resources’ Salmon in the Classroom Program and the River City Water Festival. In addition, two students, Zoey Neistat and Esteban Clark-Braendle, participated in the Groundswell WGVU workshops throughout the school year. Together they developed the idea of a horror film trailer and sketched the original storyboards. As a result of the win, the school will receive an Apple iPad Air 2 for the classroom. It was donated by the civil engineering and construction consulting firm of Fishbeck Thompson Carr & Huber in Grand Rapids. City High / Middle School was awarded second place in the contest. “It is one thing to work hard on a project – we do that all the time – but it’s really rewarding to gain recognition for your efforts, because that doesn’t happen often. We feel proud about that,” said Rosemary Lucchese, a seventh- and eighth-grade teacher at City High/Middle School. 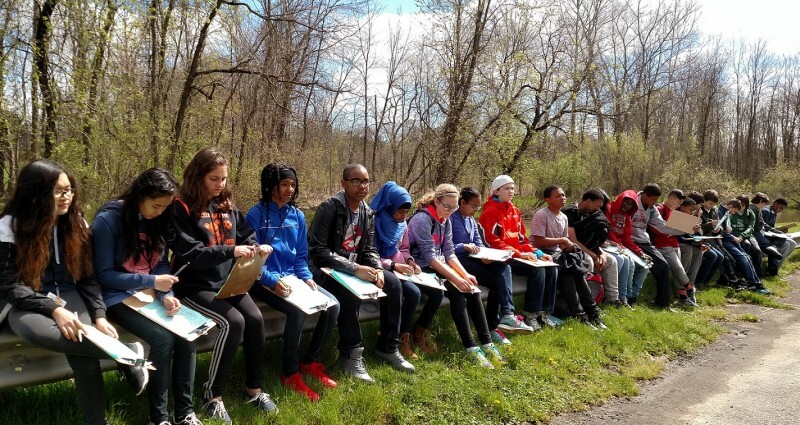 Lucchese’s class learned about cleaning up waterway drainage areas and how to label them as nondumping areas. Students created signage on the importance of caring for waterways and steps the public can take to keep them clean. The signs were posted by the City Parks Department. The goal was to educate the public about the Grand River Watershed, which is the school’s local watershed, in order to protect and improve its treatment. Among the students Lucchese praised for their efforts on the school’s video were Samantha Wendt, Aura Fuentes-Flores, Aimee Ihirwe and Sergio Tinocero. Both City High / Middle School and third-place winner Kent Innovation High School will receive a state-of-the-art restored laptop courtesy of Comprenew, the Grand Rapids computer recycler that holds the highest certification level for electronics recycling and data security in the country. The Environmental Services Department’s contest was open to all students in grades six-12 attending any school located within the City of Grand Rapids. The videos were meant to promote Grand Rapids’ volunteer “Basin Buddy” campaign that aims to keep sewer grates on city streets free of debris and leaves. The student projects depicted in these videos were funded by a grant from the U.S. Environmental Protection Agency through the Michigan Department of Environmental Quality. Among the student activities highlighted during the showcase held at Celebration! Cinema North, 2121 Celebration Drive NE in Grand Rapids, was work by seventh-grade students from Pinewood Middle School in Kentwood. 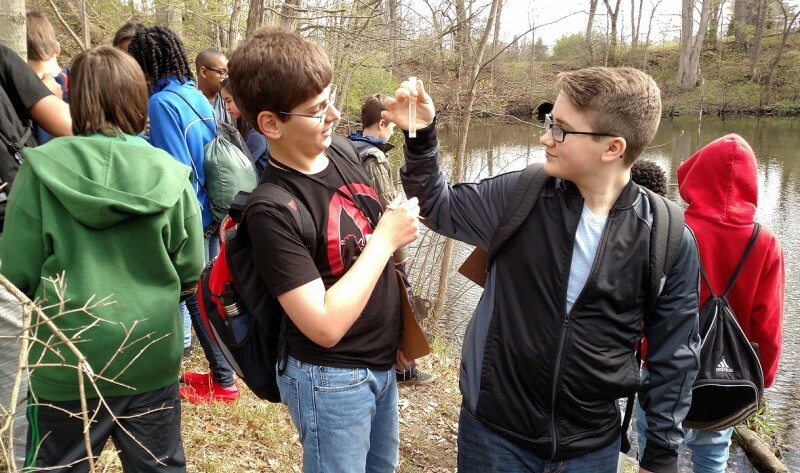 They explored the water quality of Buck Creek in Palmer Park under the direction of teachers Lesley Brown and Laura Zeichman. The students’ day in the park featured multiple exploration stations, including water quality testing for nonpoint source (NPS) pollution, macro sampling/ID to evaluate water quality at multiple sites, litter cleanup to prevent debris/pollution from entering Buck Creek, art/reflection activities on addressing NPS pollution and erosion in the park, invasive species removal and a nature walk. Students visually compared the stretch of Buck Creek where it flows through the golf course, where the turf grass is mowed up to the edge of the creek and there is erosion, with a tributary to the creek that flows through a wooded area of the park. They also compared the water quality of these areas. They explored and reflected on what is causing the differences, what impacts there might be on aquatic life and what can be done to improve the golf course portion of the creek. Groundswell participants in 2016 included Grand Rapids Public Schools students enrolled at C.A. Frost Environmental Science Academy, City High/Middle School, Grand Rapids Montessori, Grand Rapids Public Museum School, North Park Montessori, Innovation Central High (through Upward Bound TRIO) and Union High (through Upward Bound TRIO). In addition, Grand Rapids-area schools that engaged with Groundswell this year included All Saints Academy, Assumption of the Blessed Virgin Mary School in Belmont, Crestwood Middle School, Dutton Elementary School, East Rockford Middle School, Forest Hills Central Middle School, Forest Hills Central Woodlands, Forest Hills Eastern High School, Forest Hills Eastern Middle School, Forest Hills Meadow Brook Elementary, Forest Hills Northern Trails 5/6, Kent Innovation High, Lee Middle and High School, New Branches Charter Academy, Pinewood Elementary School in Jenison, Pinewood Middle School in Kentwood and Sparta Area Schools.